Biological 3D printers could repair spinal cord injuries and usher us into the post-computer era. It’s the stuff of cyberpunk science fiction — tattoos adorned with flashing lights and sophisticated circuitry. They’ll monitor our vitals, we’re told, and feed us personalized health advice in real time. They’ll wire our biology to the web, and put the internet of things at — on, in — our fingertips. They’ll enhance our five senses, and perhaps even give us new ones. This type of human augmentation is depicted in Circuits, the first episode of Glimpse, a new original sci-fi series from Futurism Studios (a division of Futurism LLC) and DUST. Watch the first episode below. Thanks to recent developments in advanced materials and biomedical engineering, wearable electronics to do all of these things may almost be here. We already have biocompatible materials that allow electronics to seamlessly fuse with the body. We’ve already developed e-tattoos that can control a smartphone. Now, it’s just a matter of refining and improving upon those technologies. In April, Michael McAlpine, a mechanical engineering professor at the University of Minnesota, published a study in the journal Advanced Materials in which he demonstrated a way to print electronics directly onto the skin. The device — cheap, accessible, and compact — already offers groundbreaking applications for the military and medicine. In the future, it could completely change how we interact with the world around us. 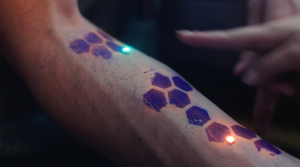 Futurism recently spoke with Alpine about his research, and the future of printable electronics and e-tattoos. Futurism: I want to start by talking about the 3D printing technology at the center of this study. What’s so special about it? Michael McAlpine: As a whole, our research group develops printers that can print beyond the hard plastics that most 3D printers use. Hard plastic has limited value. Not many people are going out and buying these printers, because no one at home really has any need to print hard plastic objects. So we’re expanding the capabilities of 3D printing beyond hard plastic, and toward what we call “functional materials.” That means printing materials that have some practical use — electronic materials, soft polymers, and even biological materials like cells — all on a single platform. We’re also integrating scanning and computer vision into 3D printing. 3D scanning enables us to scan the surface that’s being printed, like an organ, or a nerve. That allows us to print anatomically specific biomedical devices. Computer vision enables us to print on moving surfaces, like a hand. In this most recent study, we printed an electronic device directly on the skin. That’s never been done before. The printer is compensating both for the topology of the hand as well as the motion of the hand. So you have multifunctionality, you have tracking, you have complex surfaces, and you have anatomically accurate device matching. That’s what makes it unique. F: The study specifically mentions military applications for this technology. Tell us more about those. MM: The key insight we got from talking to the military folks was that they’re interested in this concept called ‘autonomy,’ meaning systems that are detached from the grid, but still have some sort of functionality. In this particular case, you can think of the 3D printing tool as a Swiss Army knife for functionality. A soldier could carry it around in their backpack, take it out in the field, and print any kind of device using only raw materials fed into the printer. So, it’s autonomous because you don’t need anything other than the printer itself in order to create a device. You can start to think about printing life-saving devices on the body, like a solar panel on the wrist, or a chemical or biological warfare sensor on an arm. The printer we use costs less than $400, it’s pretty lightweight and compact, so it can fit into a backpack. In the future, perhaps it can even be folded. F: How will this technology be used in medicine? MM: There are huge implications for medicine, and particularly for emergency responders. Right now, if there’s an accident, the patient has to wait at the site of the accident for the ambulance to show up. Then, the ambulance has to take them all the way to the hospital. So it can be half an hour or more before any real treatment takes place. But if you could just bring the printer to the patient, and print a biomedical device directly on the patient at the site of the accident, that would be a gamechanger. For our most recent paper, in addition to printing electronics on the back of the hand, we also printed cells onto the wound of a mouse. We collaborated with the dean of the medical school here, Jajub Tolar, who works on a rare skin disease where the epidermal layer flakes off as a result of a genetic disease. We were able to print regenerative cells onto the mouse’s wound while the mouse was moving. F: Let’s move to civilian applications. Imagine a world, five or 10 years from now, where printers like these are more ubiquitous, more accessible, and more capable. How could they be used in everyday life? MM: I gave a talk recently at a science fair that had a bunch of children and parents in the audience. The first question I asked was, “How many of you know what 3D printing is?” And pretty much everyone in the room raised their hand. Now, the second question I asked was, “How many of you have actually used a 3D printer before?” All the parents put their hands down, but the kids still had their hands up. So I asked, “Is that because you use it in your class?” And they all said yes. So then I asked, “How many of you actually own a 3D printer?” And pretty much everyone put their hand down. Even though these things are affordable and accessible, no one is buying them, because no one wants to print hard plastic. There’s no use for it. Even kids don’t really care that much. They can print one toy that does absolutely nothing. Then I asked, “What if you could print electronics on your skin? What if you could print your next iphone or your next smartwatch directly on your wrist? How many of you would then go buy a printer?” And then all the children put their hands back up. It’s every kid’s dream to print all kinds of flashing lights and electronic devices on their skin. It’s kind of a strange idea, having electronic tattoos all over your skin, but kids are going to do it. And then adults are going to do it too. F: I want to look a little further down the road. Where will this kind of technology take us long term? MM: All of these technologies we’re developing will lead to the post-computer era. You’re basically going from 2D to 3D [microchips to integrated circutry], which is essentially what biology is. So, that’s where the merger of electronics and biology is going to happen. Any privacy or ethical issues that spring from that aren’t going to be much different from the ones that we have with current electronics. F: What’s the next big problem or opportunity you want to tackle in this field? MM: We’re particularly excited about the idea of nerve repair [renewing or regrowing damaged tissue to restore nervous system function]. We’ve already published research on peripheral nerve repair. We’re also now working on central nerve repair, or spinal cord repair. Right now there are all sorts of different approaches to treat spinal cord injuries, from embedding scaffolds and stem cells to introducing biochemical molecules and gradients to promote regeneration. Our printing tool provides an all-in-one solution, because you can print a scaffold, and you can print cells within that scaffold. You can also print biochemical cues, and electronics within the scaffold for stimulation. And then, of course, you can tailor the scaffold so it’s anatomically specific and anatomically accurate to the patient. Having an all-in-one tool that combines all of the existing technologies used to treat those injuries could have huge implications for patients. F: It’s funny, we talk so much about technology replacing biology in the future. But I really like the idea of technology creating biology. That opened up a lot of the space for us. We recently completed a similar project with organ models, where we made lifelike organ models that were 3D printed, but felt like the organ itself. They were made out of a soft polymer. So, imagine somebody who’s recently suffered liver failure. With this kind of technology, instead of replacing their liver with a cellular version, maybe it doesn’t need to have cells or biology at all. Maybe it can be purely synthetic, and maybe it could function better than a normal liver ever could — an augmented organ.